These prominent trenches were formed by faults that pulled the planet’s surface apart less than 10 million years ago. 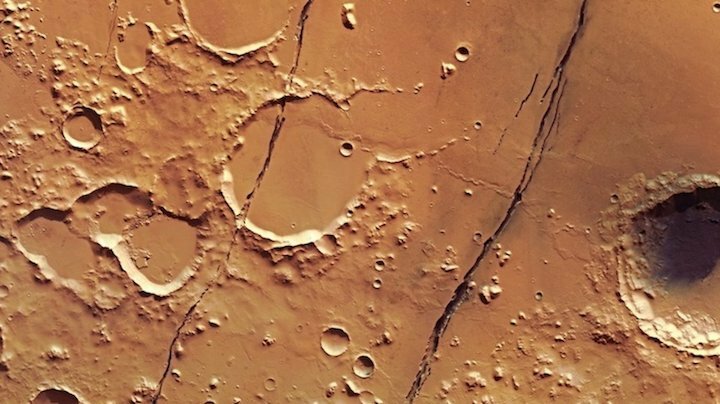 The images were taken by ESA’s Mars Express on 27 January, and capture part of the Cerberus Fossae system in the Elysium Planitia region near the martian equator. The fossae – meaning ‘ditches’ or ‘trenches’ in Latin – stretch for more than 1000 kilometres from the northwest to the southeast. They cut through impact craters and hills along the way, as well as 10 million year old volcanic plains, indicating the relative youth of their formation. They vary in width, typically from a few tens of metres to over a kilometre wide, and are thought to be tectonic features originating from faults that stretch the upper layers of the surface apart. 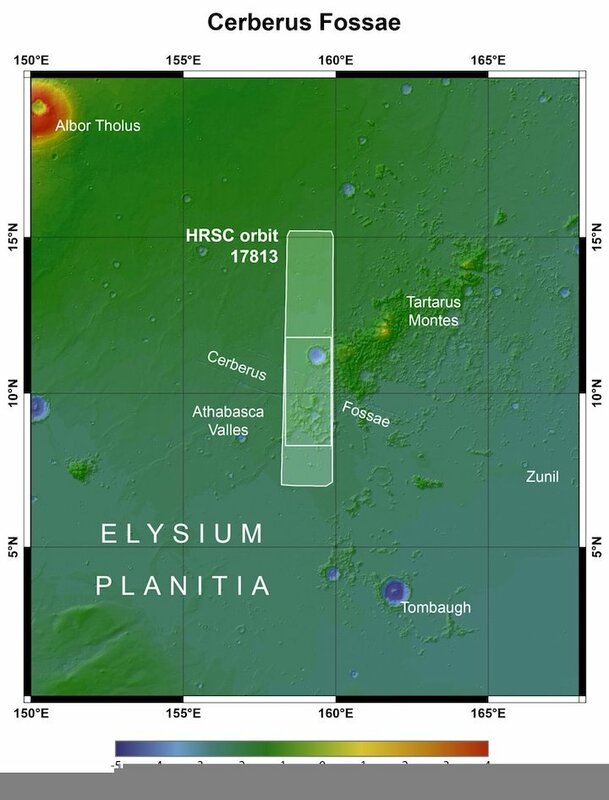 They could be linked to injections of lava at depth deforming the surface above, perhaps originating from the trio of volcanoes that are located to the northwest. Rounded collapse pits observed in the northern part (north is to the right in the main colour image) indicate an early stage of surface sinking; in other places rounded features can be seen connecting up to create longer cracks. 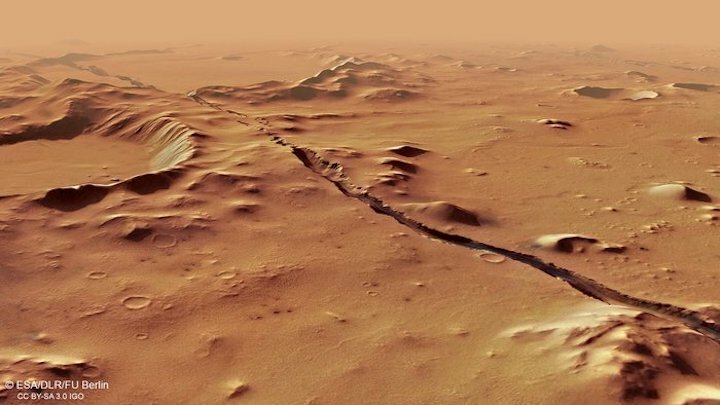 Scientists studying this region have speculated that the fractures could rupture the crust to a certain depth, allowing lava or groundwater to escape to the surface. To the west, as seen in the context image, the Athabasca Valles outflow channel links with the fossae system. The dark material seen in the largest crater at the north (right) and around some of the cracks is sand blown by the wind across the martian surface. Mars Express celebrates 15 years in orbit this year, and scientists are discussing some of the mission's highlights at the European Planetary Science Congress this week in Berlin, Germany. During its mission lifetime it has taken over 40,000 images of Mars and its two moons with the high resolution stereo camera, as well as context images with its Visual Monitoring Camera. It has also collected a vast dataset with its suite of scientific instruments that are analysing the planet from its ionosphere, atmosphere, and interaction with the solar wind, through to its subsurface with radar. 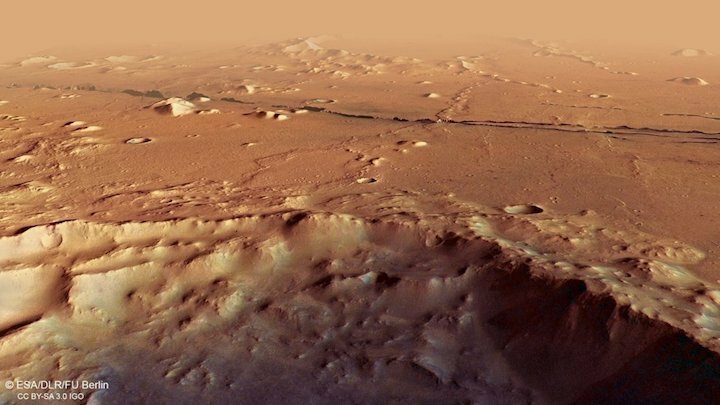 Explore all available Mars Express data in ESA’s Planetary Science Archive.